In 2013, we have no shortage of morally suspect laws to oppose, starting with a drug war that has debased our constitutional rights and created a grotesque prison-industrial complex that warehouses millions of disporportionately [sic] minority prisoners. 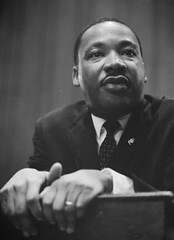 As King argued, radically and inspirationally, "one has a moral responsibility to disobey unjust laws." Thanks to his example, and the elusive, cross-partisan appeal of his words, we have a blueprint for doing just that. Not that I'm going to start using illicit substances or anything, but those are wise words. In case you missed it: Pun Salad's annual commentary on the celebration of MLK day by the University Near Here. At AEI, Mark Perry is bemused by a report entitled "Gender Equity in Education" issued by the Office of Civil Rights at the Department of Education. On most measures, females are doing much better than males in navigating the US educational industry. For example, 57% of students in post-secondary education are women; girls are less likely to be held back a year than boys; and they enjoy large majorities in enrollment in "Education and Training" and "Health Care." But females are not overrepresented in some fields, notably science, math, and IT. The report does not conclude that these disparities are a result of students' preferences and talents. And it's not even-handed: it points with alarm to the 23.9% female participation rate in postsecondary IT programs as a travesty. But an 18.4% male participation rate in Health Science? Who cares? Not Your Federal Government. Only when women (men) are overrepresented (underrepresented) on every educational metric, including STEM, will we have reached the goal of "full gender equity." The fact that men are undrepresented on almost all positive educational outcomes and overrepresented on negative outcomes (like being held back a grade for academic defiiency) is apparenly completely consistent with the Office of Civil RIght's goal of "full gender equity," which apparently inequitably only applies to one gender? My cynical take: people employed in the Grievance Industry will always find it worthwhile to find reasons to Grieve. The standard disclaimer for Johnny Depp movies: Mrs. Salad loooves Johnny Depp. But this one didn't even make it for her. Folks of a certain age might remember that "Dark Shadows" was an actual soap opera on Daytime TV back in the 60s. I think I may have watched 5 minutes of it back in 1966. This incarnation is played more for goofy laughs. Mr. Depp plays Barnabas Collins, heir to a fishing magnate in coastal Maine back in the 18th century. But he makes the mistake of jilting a witch, Angelique, a psycho who destroys his true love and turns him into a vampire. The townspeople, outraged at his subsequent thirst for their blood, bury him alive. And so things sit until 1972, when he's accidentally dug up by a construction crew. After making short work of them, Barnabas returns to his manor to find the dissolute remains of his family, together with a bunch of ne'er-do-well hangers on. And worse, Angelique is still around to make trouble. It's genuinely funny in spots, but too much of the humor is forced.